Although set against the background of the Second World War. 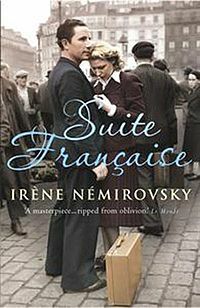 Suite Française is not a war novel in the usual sense, in that the author is more interested in the people and their reactions to their situation than in the conduct of the war itself. The setting for the novel is France under the German occupation and begins with the flight from Paris during the German invasion There is little about the horrors of war. neither are there great acts of heroism. It is a situation where it is “everyone for himself and shows how quickly society can break down when the normal structure of life we take for granted falls apart. In the second part of the book, the pace is slower, and follows the life of one small village under the occupation. To begin with there is a breaking down of barriers. The occupying army are seen as being “human” and arc sympathetically portrayed, especially the young German officer who is lodged with a French family and begins to form a strong friendship with the daughter-in-law of the house while her husband is a prisoner-of-war. The book reaches a climax when a local farmer shoots a German officer is sheltered by the daughter-in-law in the same house. Her husband later met the same fate. She left two small daughters, who were hidden by their governess and survived the war. bringing with them a suitcase containing the manuscript which they did not bring themselves to read until 1975. It was eventually published in 2004. It is the way that the novel lay undiscovered for so many years, as well as the tragic death of the author, that gives it an added poignancy. However, we all felt that the novel stood on its own for its characterization and for the sharp observation of how people react in a situation where the world around them is falling apart.